David and Ruth Waterbury’s collection of contemporary wood art, formed over the last 30 years, is considered one of the best in the country. This year, the Waterburys donated 30 works from their collection to the museum, supplementing two works they had given earlier. It’s fitting that part of their collection has found a home here—the Minneapolis residents learned about turned wood when they encountered a work by O‘ahu artist Ron Kent during one of their annual winter stays in Hawai‘i. Their gifts on view in this exhibition demonstrate superb craftsmanship, artistry, and diversity of techniques, and reveal the changing approaches to the medium, from simple turned vessels to sculpted and constructed works. 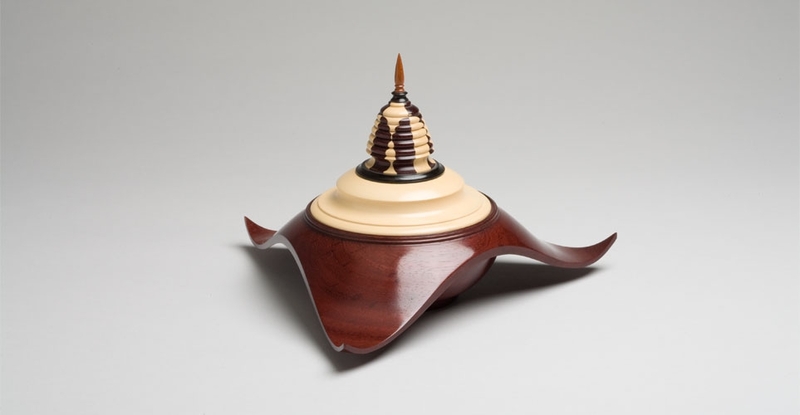 On view are works by such prominent wood artists—national and island-based—as Gerald Ben, Derek Bencomo, Sharon Doughtie, Giles Gilson, Michelle Holzapfel, Robyn Horn, Todd Hoyer, Ron Kent, Stoney Lamar, Mark Lindquist, Michael Mode, Liam O’Neill, Rude Osolnik, Betty Scarpino, Hayley Smith, and Alan Stirt.